Fighting out of Donetsk, Ukraine, Nikita “The Miner” Krylov, 27, was one of the winners at “UFC 236.” It was his seventh victory in the Ultimate Fighting Championship. Featuring 13 mixed martial arts matches, “UFC 236” took place at the State Farm Arena in Atlanta, Georgia, United States on April 13, 2019. 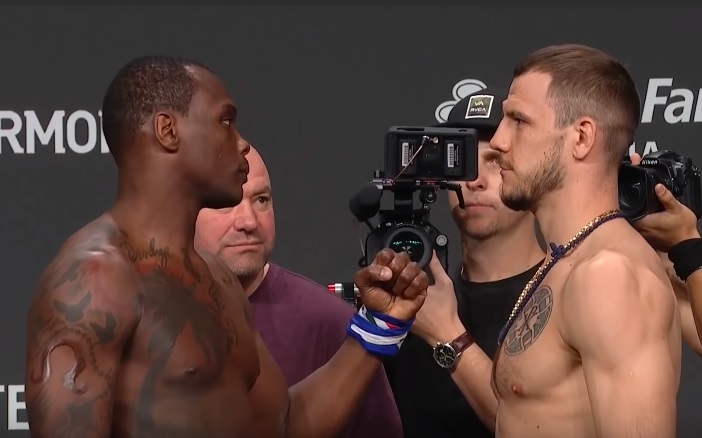 In the ninth bout of the evening, Krylov competed in the light heavyweight division against Ovince “OSP” Saint Preux, 36, of Knoxville, Tennessee, USA with Blake Grice as the referee. Grice put a stop to the light heavyweight contest after 2 minutes and 30 seconds in the secodn round when Krylov submitted St. Preux via rear-naked choke. It was the second submission finish of the evening. Winning at “UFC 236” improved Krylov’s professional MMA record to 25 wins and 6 losses. On the other hand, St. Preux now has 23 wins and 13 losses. The bout between Krylov and St. Preux at “UFC 236” was a rematch. Their first encounter took place at the American Airlines Center in Dallas, Texas, USA on March 15, 2014 at “UFC 171” where the American contender submitted his Ukrainian opponent via Von Flue choke. Including St. Preux, four fighters defeated Krylov in the UFC octagon. The other three were Soa “The Hulk” Palelei, 41, of Perth, Western Australia, Australia, Misha Cirkunov, 32, of Toronto, Ontario, Canada and Jan Blachowicz, 36, of Warsaw, Poland. Also including St. Preux, seven fighters lost to Krylov in the UFC octagon. The other six were Walt “The Big Ticket” Harris, 35, of Homewood, Alabama, USA, Cody “Donnybrook” Donovan, 38, of Denver, Colorado, USA, Stanislav “Staki” Nedkov, 37, of Veliko Tarnovo, Bulgaria, Marcos Rogerio “Pezão” de Lima, 33, of Ribeirao Pires, Sao Paulo, Brazil, Francimar “Bodão” Barroso, 39, of Rio de Janeiro, Brazil and Ed “Short Fuse” Herman, 38, of Fort Collins, Colorado. Including Ukraine and the U.S., six countries were represented at “UFC 236.” The other countries are Brazil, Germany, Nigeria and Russia.